It may finally be time to get genuinely excited about a Star Wars Game again. Star Wars Celebration is currently invading Chicago and Lucasfilm is showing off an awful lot to fans. While Episode IX, aka The Rise of Skywalker, has largely dominated the conversation, video games have always been a very important source of storytelling in a galaxy far, far away. 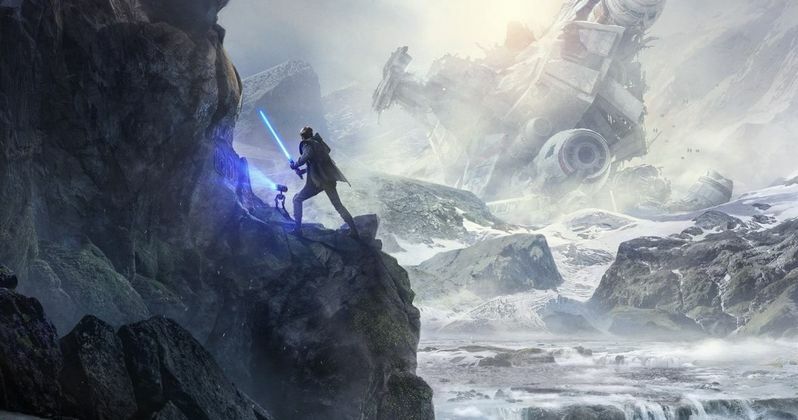 Luckily, the folks at Respawn Entertainment were on hand to showcase their new game, Star Wars Jedi: Fallen Order and, to put it mildly, this thing looks stunning. Respawn has been working on Jedi Fallen Order for several years, in conjunction with EA, who didn't actually have a presence at the panel. Instead, it was all the Respawn development team, as well as those from Lucasfilm who contributed to the story. Stig Asmussen (God of War) serves as director and he assembled a crack team of gaming developers from many different walks of life. He also worked in tandem with the Lucasfilm Story Group to ensure that they could tell an actual story that has a place in the overall Star Wars canon. So what is that story, exactly? While they're still keeping a relatively tight lid on things even at Star Wars Celebration, Jedi: Fallen Order centers on a former Jedi Padawan by the name of Cal Kestis, one of the last surviving members of the Jedi Order after the purge of Order 66. For those who may not recall, Order 66 was what happened during the events of Revenge of the Sith, whereby Palpatine ordered that the entirety of the Jedi order be killed. However, a select few survived, with Cal being one of them. He's now on the run during the time period between the events of Revenge of the Sith and A New Hope. During the Disney era, Lucasfilm hasn't done all that much on the game side of things, save for the Battlefront games, which were mostly online shooters. In this case though, we're getting a dedicated single-player, combat-focused game with no multiplayer and no microtransactions. When that bit was confirmed at the panel, people went nuts. The only thing that topped it was when they rolled the trailer, which focuses heavily on the story (and has since made its way online). Visually, it's stunning and it feels like a proper story within the franchise, which is what the best Star Wars games do very well. One of the biggest surprises at the panel came when it was revealed that Cameron Monaghan, who people may know from his work as the pseudo-Joker on Gotham, is playing our hero, Cal. Monaghan seemed genuinely stoked and all of the character work that we saw made it appear as though he's really bringing something to the role. He did a lot of motion capture and actual, physical work for the game, beyond providing the voice. All of the behind the scenes action we were shown looked very impressive. Very much the kind of action fans want when they have a lightsaber in their hands. A little about Cal. Ever since Order 66, he's been lying very low and trying to blend into the scenery. He's a member of the Scrapper's Guild and tears apart old, wrecked ships for a living. Cal has a droid buddy, who is described as his equal, named BD-1. We have some images of the little guy below, but he almost looks like a projector with a kickstand attached to a wheel. BD-1, both literally and figuratively, provides light in the darkness. It was described at one point as a boy and his dog relationship. So what about the villains in this video game? This part of the game seems particularly meaty and cool. Our main antagonist is the Second Sister Inquisitor. Anyone who watched the Star Wars Rebels animated series is already very familiar with the Inquisitors, but for those who haven't, these are basically Sith-adjacent Force wielders who are tasked with hunting down Jedi. This particular character was teased in an issue of the Darth Vader comic book series from Marvel, as it turns out. Helping this new Inquisitor (who looked absolutely vicious in the trailer and design wise, looks awesome by the way) are some new Stormtroopers. These black and red fellows are named Purge Troopers and they're specifically trained to combat and detect Jedi. They help the Inquisitors track them down. The idea behind the Purge Troopers is that the team didn't want this to just be a hack and slash game where the player can just tear through throwaway villains, such as your average Stormtrooper, with un-challenging ease. Instead, these particular foes will present an actual challenge. Speaking of the combat, Stig Asmussen talked about how the combat will be easy to learn, for those who just want to play and manage the game. However, those who want to spend a bit more time and get more involved can master the combat system on a more in-depth level. One final, very interesting detail has to do with Cal's lightsaber. At one point, someone asked about Cal's lightsaber on the panel, to which one of the developers said,"How do you know that's Cal's lightsaber?" They were very tight-lipped beyond that, but it was made explicitly clear that this particular lightsaber will play a major part in the game's story. For now, that remains a big mystery. Overall, as a first look, this was a complete 10/10 home run. A great many fans have been waiting for a great Star Wars game ever since Disney purchased Lucasfilm in 2012. We may very well, at long last, have the game coming our way. Star Wars Jedi: Fallen Order arrives on PS4, Xbox One and PC on November 15. For those who may have missed it, we've included the trailer to check out. Also, be sure to check out the first poster for the game from EA, as well as our photos from the panel, below. This was @cameronmonaghan's first game. He did motion capture and the whole deal. "How do you know that's Kal's lightsaber"